(COVINGTON, La.) Over 2.03 million students take the ACT every year, with an average score around 20.6 on a scale from 1-36. Students wake up early on a Saturday morning to trudge through the rigorous four- (or five-, depending on if you take the test with writing) hour mega-test. Ahead of the SAT (Scholastic Assessment Test), the ACT (American College Testing) is the most frequently taken standardized test for college admissions. While over 2.03 million students complete the test, only 6% (roughly 121,500) earn a score of 30 or above. If you score a 34 or 35, you have entered into the 99th percentile. This does not mean you scored a 99 on the test, it means that only 1% of test takers had a higher score than you did. The 36ers, the 100th percentiles, could be considered the golden boys. Fittingly enough, St. Paul’s junior Jackson Gold is the latest golden boy, hitting a 36 composite on his most recent ACT. His score now puts him atop the ranks of current St. Paul’s students, jumping over the three seniors with 35s: Patrick Baldone, William James and Jack Nunez. Along with the achievements of Jackson Gold, his classmates Andrew Norlin, Ross Hightower, and David Needles each scored a 35 composite. Gold has now become one of approximately 1,200 students who earned a perfect score, putting him in the top .06% of students who have taken the ACT. It very well may run in the family, as Jackson’s older brother, Max (class of 2015), earned a 35 on the ACT during his senior year. For those students who receive high scores on the ACT, their time and effort is rewarded with prestigious merit scholarships from high ranking colleges and universities. Almost $1 million in scholarships have been accrued between the three aforementioned seniors. 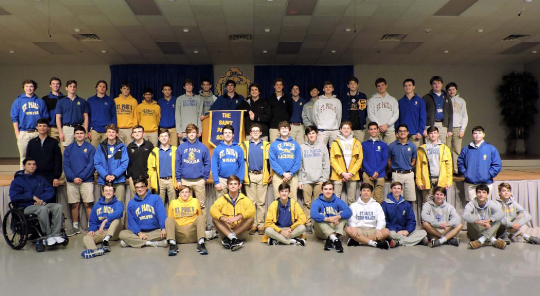 Over the past several years, St. Paul’s has worked to create a strong curriculum that, while teaching the necessary information for the classroom, emphasizes preparation for standardized testing. As the number of SPS students to achieve a 35 or 36 continues to rise, it would appear those efforts are paying off.